What Can Make the Plants Grow? A Rain Barrel! Two years ago, I was living in a loft conversion in the New York City neighborhood of Bushwick. One of the big perks of living here was our roof access – which we turned into a rather extensive rooftop garden. We had heirloom tomatoes, cucumbers, squash, chard, and any number of other vegetables (and perhaps a few fruits). But one of the major issues we faced was watering our garden, especially on hot, dry days. Up on a tar-covered urban roof, raised planters (especially wood planters) dried out quickly. At the time, our only recourse to prevent our plants from dying was to carry gallon jugs of water up four flights of stairs several times a week. It occurred to us a few weeks later that we should have collected dew and rainwater in barrels and use those for irrigation! 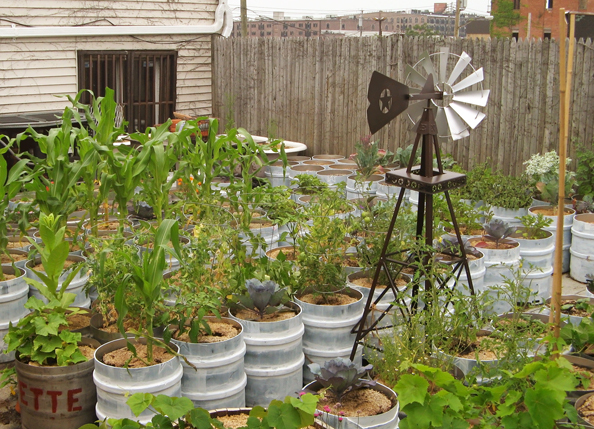 Even though our plans for rooftop rain barrels never panned out, capturing and reusing rainwater for a garden – or a lawn – is a really great idea. It cuts down on municipal or well water consumption, reducing your impact on the environment, and on your wallet. And if you’re watering a rooftop garden, it saves you the torture of carrying dozens of gallons of water up the stairs! The Bosmere Pop-up Rain Barrel holds 50 gallons of rainwater from the rain or a downspout. A screen keeps out leaves and other debris. This collapsible rain barrel can be stored flat in a work shed or garage and pulled out when you need it. A handy on/off spigot at the bottom can be attached to a hose or the collected water can be accessed through the wide-mouth top which opens with a zipper for easy pail-filling. The Garden Watersaver rainwater diverter makes it easy to redirect the rainwater flowing down your downspout to a rain barrel. It Installs right onto your downspout in minutes and is easy to activate and de-activate as needed by removing the hose & adding the plug in winter. The Slim-Line Water barrel holds 26 gallons of water and is made from molded UV-stable plastic. It comes with its own stand so that you can fill your watering can easily from the tap provided. The barrel has snap on-off lid for easy filling and keeping insects & debris out. This tool is designed to be unobtrusive and compact for small gardens, patios and decks. We’re always really excited when a new business uses recycled and sustainably-sourced materials to build their space. 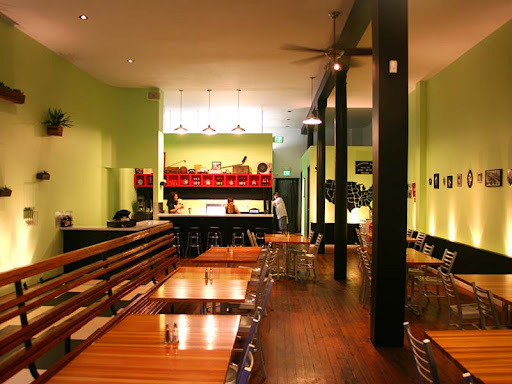 Greenburger’s is a new restaurant in the Lower Haight, San Francisco, that has used principles of sustainable design in setting up their business. Neighborhood blog Haighteration has an extensive article with numerous photographs discussing the space, but one thing we’re particularly interested in are the materials Ecohaus (now part of the Green Depot family) provided to Greenburgers to help them build themselves sustainably. One of the features of Greenburger’s space is its use of recycled and sustainable materials. Haighteration goes into detail on this, but the Nudelman’s used a pre-existing structure in the building to construct a bench that spans the length of the restaurant. The countertops are made from recycled glass and porcelain. And Ecohaus provided part of the floor – Marmoleum planks in a semi-checkerboard design. We also provided the countertops, Eco by Cosentino, and American Pride low-VOC paints for the interior. Definitely an innovative space – and menu – with a number of recycled and new green products, upping Greenburger’s sustainability cred. If you find yourself on the West coast, they absolutely deserve a visit. Not Just a Container: A Contest! When considering sustainable design, reuse is one of the most significant ways in which a green construction project can reduce its environmental footprint and bolster its sustainability credentials. Urban Space is an organization devoted to showcasing independent designers, chefs, and boutiques throughout the United Kingdom and the U.S. If you live in New York City and have visited one of the Christmas markets in Union Square, Columbus Circle, or elsewhere, you are seeing the work of Urban Space NYC. This is in keeping with the organization’s ethos of community and urban revitalization, and a showcasing of local goods and services – certainly one of the main focuses of the environmental movement in recent years. The winner will be awarded with a container license rent-free for six months, a $3,000 design and construction budget, a one year membership to 3rd Ward, a one year membership to the Brooklyn Chamber of Commerce, press exposure, and an online feature. In addition to these awards, Green Depot will be furnishing sustainable building materials to help complete the project! The deadline for entry is April 9. 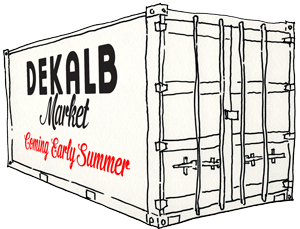 To learn more about the competition, visit the Dekalb Market’s webpage, located here. For green building materials, like eco insulation, as well as many othergreen products for a sustainable lifestyle, visit http://www.greendepot.com. In current environmental news, Rupert Murdoch’s News Corp has achieved its 2007 goal of going carbon neutral by 2010. GreenBiz reports that the company, which owns a huge variety of businesses including Fox News, 20th Century Fox, Harper Collins, Wall Street Journal, and MySpace, not only announced the achievement of this goal, but a new set of sustainability initiatives for the long- and short-term. News Corp achieved its goals through tangible investments in its environmental impact profile – from retrofitting all of the lighting in News Corp facilities, to constructing massive solar arrays, to reducing the size of DVD packaging to save on raw materials and transportation emissions. What the company couldn’t tangibly change to reduce its carbon emissions, they accomplished through the purchasing of carbon offsets. Carbon offsets have raised a degree of controversy since 2007, when News Corp made its neutrality pledge, but News Corp has responded by pledging to reduce absolute greenhouse gas emissions by 15 percent by 2015, compared to 2006 levels. The company has set out a number of other 2015 goals, which include reducing GHG intensity by 15 percent, investing in clean energy equal to 20% of electricity used, engaging its 100 largest suppliers on improving their environmental impacts, and measuring and significantly reducing its waste footprint. News Corp has also set out a set of aspirational, deadline-free goals including 100% clean energy consumption, grow business without growing GHG emissions, minimizing all solid waste sent to landfills, and engaging readers, employees, and customers on sustainability. Investing on energy reduction strategies has already seen a massive return on investment, Green Biz reports. Simply by making News Corps’ data centers centralized, the company is saving $20 million dollars a year; each ton of carbon avoided has already yielded about $180 in savings. Indeed, efficiency measures seem to have achieved a return on investment in less than two years, which is surely encouraging to any company (or person) seeking to reduce their energy consumption, and greenhouse gas emissions. While most people are aware that using compact florescent light bulbs is energy-saving, even more efficient are LED light fixtures. In the past, these were far too expensive for the home or business owner to consider, but in recent years prices have come down substantially. The LED Undercabinet Fixture replaces standard florescent fixtures. Sponsored by the U.S. Department of Energy, its innovative design is engineered to emit comparable light to a typical fluorescent under-cabinet fixture, but will use approximately 1/2 the energy. It has won the DoE’s Solid-State Lighting Quality Advocates label, which was created to assure and improve the quality of LED lighting products. Motion sensors for light fixtures also reduces the amount of energy consumption from lighting. Green Depot carries several models. The WattStopper CH-250 Passive Infrared (PIR) Multi-way Vacancy Sensor helps save energy. Users must press the pushbutton to turn on lighting by turning off lights when no one is in a room. The CH-250 employs PIR technology to sense the difference between the infrared energy from a person in motion and the background space. It keeps lighting on as long as motion is detected and provides automatic shutoff, following a user-selected time delay, when motion is no longer detected. Users may turn the connected load off manually. One of the most significant ways in which individuals contribute to greenhouse gas emissions is through their household energy consumption. Heating homes and heating water are two of the most energy-intensive activities that occur in a home. We’ve written extensively in the past about insulating homes and the added benefits of fitting your home so that it retains more heat, instead of losing it. This is better for reducing heating costs, and thus for reducing our environmental footprint – approximately 4 metric tons of carbon dioxide are emitted each year from residences, most of which is the consequence of home heating. Conventional fiberglass insulation is a suspected carcinogen, so using a green product like Bonded Logic Ultratouch Recycled Cotton Insulation is a major step towards making a greener home. For an even more efficient home, National Fiber Cel-Pak Cellulose Insulation is a blow-in material that settles into the tiniest corners and cracks of walls, ceilings, and attics. Water heaters are one of the largest consumers of energy in the average home, and swapping out an older-model water heater for a new, energy-efficient model can substantially reduce energy costs. The GeoSpring Hybrid Water Heater is an especially energy-efficient model, qualified by ENERGY STAR. It combines heat pump technology with traditional electric elements to save the homeowner up to 62% on annual water heating expenses — even up to $320. One of the most energy-efficient buildings in the United States, the Research Support Facility, is located in Golden, Colorado. The building — green by any standard — is one of the first commerical buildings in the U.S. to attempt accomplishing a complete energy neutrality, meaning that the building produces as much energy as it consumes, or zero net energy consumption. This is no minor accomplishment, and as the New York Times reports, involves a total rethinking of how an office building works. From the sub-basement to the parking lot, each feature of the building was considered to reduce its energy consumption, maximize efficiency, and inculcate an attitude of energy conservation in the employees working in the building. Commerical buildings account for nearly 18% of energy consumption in the U.S., so creating a successful energy-neutral office building could have far-reaching reverberations across the country. The number of innovations and inventive ideas in green buildings is truly staggering, and some of these basic principles can be applied even in a regular person’s home. Below are two options to significantly reduce energy consumption in an average household. Bonded Logic Ultra Touch Insulation. We’ve written extensively in the past about insulating homes and the added benefits of fitting your home so that it retains more heat, instead of losing it. This is better for reducing heating costs, and thus for reducing our environmental footprint – approximately 4 metric tons of carbon dioxide are emitted each year from residences, most of which is the consequence of home heating. Conventional fiberglass insulation is a suspected carcinogen, so using a green product like Bonded Logic Ultratouch Recycled Cotton Insulation is a major step towards making a greener home. For an even more efficient home, National Fiber Cel-Pak Cellulose Insulation is a blow-in material that settles into the tiniest corners and cracks of walls, ceilings, and attics. For many green products, including new green building materials carried by both Ecohaus and Greendepot, visit our websites: http://www.greendepot.com, and http://www.ecohaus.com.